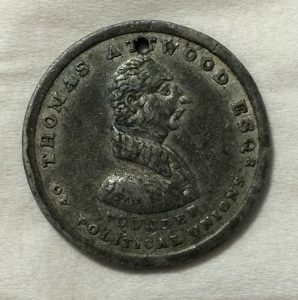 Thomas Attwood was the founder of the Birmingham Political Union, a hero of the campaign for the 1832 Reform Act who was involved in the early stages of Chartism. This is his life story. Thomas Attwood was in some ways an accidental revolutionary. Although actively involved, if not the leading force, in seeking parliamentary reform over a period of many years, he took up the cause as a means to secure economic change rather than as a democratic end in itself. Born 0n 6 October 1783, Attwood was the son of a successful businessman with coal-mining and banking interests in the West Midlands. He began work in his father’s Birmingham bank and soon became active in the campaign against the East India Company, whose monopoly of foreign trade restricted export opportunities for local businesses. In 1812, he led a Birmingham delegation gave evidence to a parliamentary select committee looking into the East India Company’s activities, and began to take a wider interest in economic issues. His advocacy of a paper-based currency not linked to gold and of increasing the money supply to stimulate the economy would be widely recognised and supported today. After failing to convince the Tory government led by the Duke of Wellington, despite a 40,000 strong petition supporting currency reform, Attwood became convinced that political reform was necessary to ensure that business and economic expertise was represented in the House of Commons. In 1829, a Birmingham Political Union “of the lower and middle classes of the people” began to coalesce, informally at first, but increasingly as a more permanent organisation. The rules of the new body were put to a public meeting of around 10,000 people chaired by the radical MP Sir Francis Burdett on 25 January 1830 and agreed. The vote for all men who directly or indirectly paid local or national taxes. During the course of 1830, support for the cause of parliamentary reform took flight. A meeting at Beardsworth’s Horse and Carriage Repository in Birmingham’s market district in May was attended by over 80,000 people. Political unions were set up in London, Leeds and elsewhere, and by the end of the year there were 27 political unions across the country. Despite the opposition he had encountered from the Duke of Wellington’s government, Thomas Attwood considered himself a Tory and believed that reform would only come from a Tory government. The BPU was opposed by local Whigs and in turn denounced the Whigs as insincere in seeking reform. It was, however, the fall of Wellington and the appointment of a new Whig government led by Earl Grey that opened the door to reform. Grey’s government introduced two unsuccessful Reform Bills before a third finally became law – and then not before a constitutional crisis was resolved only when Grey convinced an unwilling King William IV to promise to create sufficient new peers to get the Bill through the upper house. The Lords backed down and the Representation of the People Act 1832 became law. In the general election which followed, based on a reformed electorate and with Birmingham among the cities to gain representation in Parliament for the first time, Thomas Attwood was returned unopposed as one of the city’s first MPs, alongside Joshua Scholefield, his friend and deputy at the Birmingham Political Union. Attwood now returned to his main interest in seeking currency reform, but once again failed to gain the support of the government of the day. By 1837, he favoured further parliamentary reform as a means of gaining support for his economic ideas, and in May of that year the Birmingham Political Union was revived. During 1838, the Birmingham Political Union began to work closely with the London Working Men’s Association, the two organisations sharing many of their demands for political reform. Both Attwood and Scholefield, however, became uneasy at the influence of more radical voices within the emerging Chartist movement. Despite his reservations about the attitude of the First Chartist Convention to the use of violence, and his personal opposition to the Chartist demand for equal electoral districts, it was Thomas Attwood who presented the first Chartist petition to Parliament in June 1839. When a vote was taken a month later on whether to consider the Bill, the motion as defeated by 235 votes to 46. Frustrated at Parliament’s refusal to consider further political reform and by the lack of interest of the Chartist movement in currency reform, Attwood left the House of Commons and politics for good. By the time he died in 1856, he had become an obscure figure, and few obituaries appeared in the press. He would be commemorated by the erection of a statute in 1859 in Stephenson Place at the entrance to Birmingham’s London and North Western Railway station (now known as New Street). The statue was moved from Stephenson Place to Calthorpe Park in 1925 and moved again Sparkbrook (close to the site of the Larches, the house where Thomas Attwood lived between 1808 and 1812) in 1975. It was removed for renovation and placed in storage in 2012. Today, however, there is a second and less formal statue of Thomas Attwood to be found in Birmingham’s Chamberlain Square, where he stands (or rather sits) alongside some of the city’s other greats in a busy public space bordered by Birmingham’s central library, town hall and museum and art gallery.